Background: The NWA visits the Meadowlands Arena on Friday 8/16/85, just two days before Bruce Springsteen and the E Street Band begin a legendary stand of six sold out shows at Giants Stadium just next door. 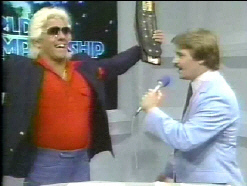 Flair defends the NWA World Title against Sgt. 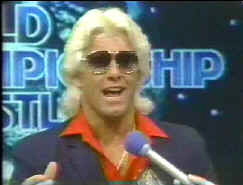 Slaughter, and the next morning jets to Atlanta to appear on World Championship Wrestling, knowing Bruce will be hitting the stage at Giants Stadium the next night.